Get your artist engaged this Summer vacation in a fun-filled week of many mediums and many art pieces! They will work on Painting, Drawing, Pottery& Ceramics, and new to this summer is MonoPrinting! 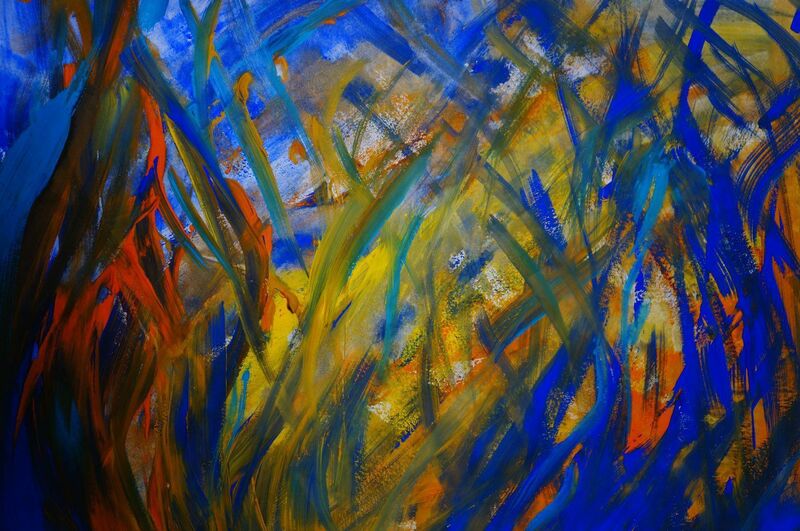 Come learn and inspire the sunny theme of summer in your artwork! Payment must be made beforehand to reserve spots, call to pay. *Dates and times for our camps are posted below. Our booking system works on a “first contact, first reserve” basis. Please remember to book your camp at least 1 month in advance by replying with your desired week and camp time (AM or PM) so we that can check our availability with time and reserve your spot!. Registrations are open, please send us an email to register! 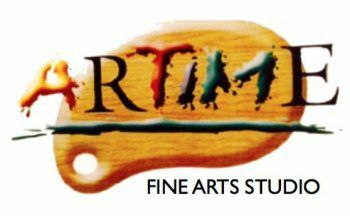 call (949)981-4988 or email artimecamps@gmail.com. $130 per student, all materials incl. 20 spots max, 10 spots min. CALL or EMAIL to reserve today! We would like to thank all of our Summertime Campers and Families! We had such a great summer and we could not have done it without all of our participants! To continue your art experience during the school year, check out our Morning and AfterSchool On-Going ART Classes. We have many available for those who want to practice any of the mediums learned in the camps and advance their skills into making beautiful artwork. Check out our schedule of classes for Fall 2018 in our Classes and Schedule tab! Call or email us to check availability! Staying home this Spring Break? Get your kids busy in a week long camp filled with many seasonal projects in all mediums! We will be working on Pottery and Ceramics, Acrylics, Watercolors, Sketching, and Chalk Pastels. All with a fun nature-spring theme! Sign ups start March 5th! Sign up before to save your spot! Call or email us! We Can Go To Your School Too! Artime Academy is a part of our studio that travels to schools teaching on site as an after-school program. Many schools in the OC area havent had the chance to provide art classes for their students. We at ARTime Studio believe that all kids should have the opportunity to learn about art at least in school. We travel to schools in SaddlebackVUSD, CapoVUSD, and LAUSD school districts and are always looking for more schools to teach in! If your school needs after-school art classes, talk to your PTSA and contact us! winter camp 2017 is COMING! Sign up for our 4 Winter Camps this holiday season! JOIN US FOR THIS YEARS ARTISTIC CELEBRATION! A Christmas Chalk Walk at The Church of Jesus Christ of Latter-Day Saints in Aliso Viejo December 14-16. We love to share the holiday spirit through chalk art and would love for our students to join us this year in creating a chalk masterpiece! Either as a spectator or participant, this event is a fun and unique holiday festival full of wonderful activities and art! Come and check out our square at this event! Going On The Week Of Thanksgiving! Its the month of giving! And what better way to celebrate it than by having your kids create artwork that they will be able to give to friends and family this year for the holidays! We have a great holiday morning 4-day camp coming up the week of Fall/ Thanksgiving Break, November 20-23, 2017, Monday-Thursday 9-12 pm. We will be working on and learning many different medias while creating beautiful pieces of artwork that your loved one will surely love! Sign up online by filling out our enrollment form (include the name of the camp: Fall Break Camp) and call (949)981-4988 to confirm enrollment into our camp! DIA DE LOS MUERTOS CON ARTIME! Come celebrate with us! 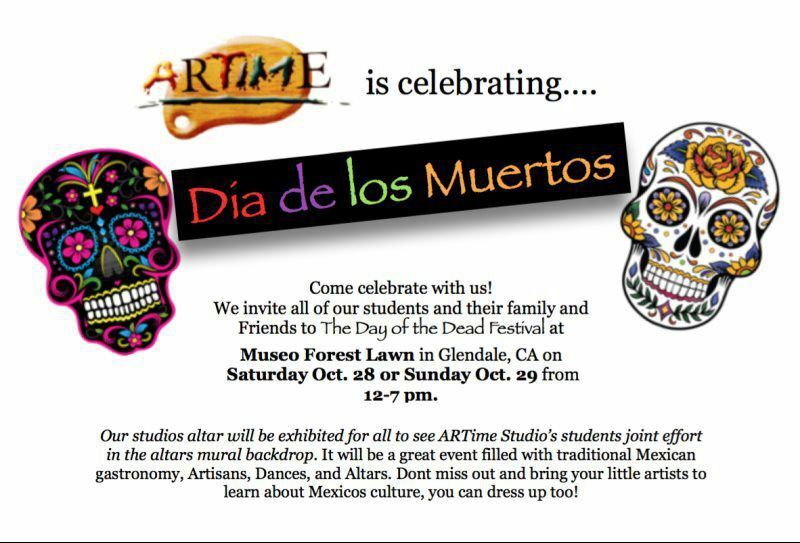 We invite all of our students and their family and Friends to The Day of the Dead Festival at Museo Forest Lawn in Glendale, CA on Saturday Oct. 28 or Sunday Oct. 29 from 12-7 pm. Our studios altar will be exhibited for all to see ARTime Studio’s students joint effort in the altars mural backdrop. It will be a great event filled with traditional Mexican gastronomy, Artisans, Dances, and Altars. Don't miss out and bring your little artists to learn about Mexico's culture, you can dress up too! Now offering workshops with guest artist: maaria kader View Gallery for more pics! Scratchboard Workshop SIGN UP TODAY! Our Summer Camps Start June 5-August 25! Spread The Word So That Everyone Can Enjoy A Summer Of ART! SIGN UP via email at artimecamps@gmail.com !!!!!! of all of our ongoing artists artwork. The open-house will take place in our Mission Viejo Studio on Saturday June 18th from 11-4pm! Invite your friends and family to come see your artwork! You are free to come by at any time. Refreshments will be served. The exhibition will include pieces made in the Fall of 2015 until Spring 2016. Each student will show 4 pieces including Acrylics, Sketching, Pastels, Watercolors, Oils and Ceramics. Come and enjoy the great artistic achievements you've made and celebrate the journey to follow! Sign up your kids TODAY to have them enjoying an ART FILLED SUMMER at ARTime Studio! Acrylics, Watercolors, Chalk Pastels, Sketching, and POTTERY/CERAMICS! Call or email us to reserve your child's spot ASAP! Come enjoy an exciting week of fine art camp where you will learn medias like ACRYLICS, WATERCOLORS, SKETCHING, CHALK PASTELS, and POTTERY! Morning and afternoon camps from end of June to Aug.! Spots still available for SUMMER ART CAMP 2016 @ ARTIME! PAYMENT: No deposit is required, CALL/EMAIL beforehand to reserve your spot, payments are to be made in advance. Call, Email, or Come by the studio to make your payment ASAP! Thank you! If for any reason you Cancel the reserved week or Change the week for another, please let us know at least 2 weeks in advance. Cancellation of your week will be subject to no refund but ARTime Studio can honor your child a different week during the 3 months or for our ongoing classes. Open Registrations start APRIL 24th! Sign up today! Create an Art Project your Parents will Love! from Monday April 25th thru Sunday May 1st! from Monday June 6th thru Sunday June 12th! Please reply with your desired date for time availability. If any desired date/time fills up before we receive your reply, not to worry! We will let you know and you can choose another session. or BOTH events if you wish! 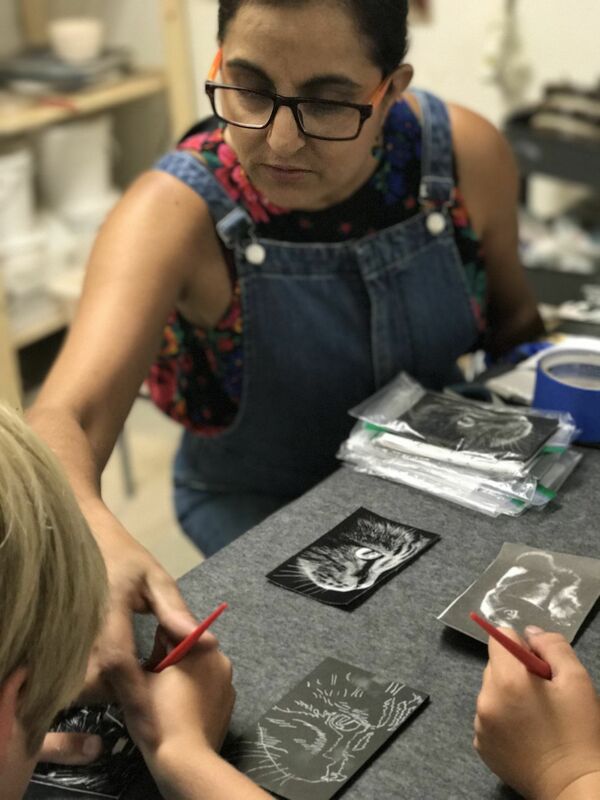 We are excited to offer this special event and believe that your troop will be excited too as they make unique canvas.ceramic masterpieces for their mothers and fathers! A completed and wrapped gift to take home to that special person! $20 per scout for a one hour session with materials included. Pay with Credit Card, Cash or Check at the time of reservation or on the day of your art event. SHHH..... YOUR PARENTS WILL LOVE THEIR GIFT, SO KEEP IT A SECRET! 2016 Imagination Celebration with ARTime! The Art of a Potter and The Art of Watercolors! Starting on April 11-May 24, ARTime Studio will help host events for the nation-wide art fest with Imagination Celebration. Contact us for specific dates and times! ARTime Studio is a proud partner of the Girl Scouts of Orange County, helping scouts earn their art badges through art sessions at our studio! We offer 1-2 hour sessions where you can bring your troop and as a group learn how to paint, sketch, throw and create masterpieces that you will get to take home. Scouts love this opportunity because along with spending time with your troop creating, at the end of the session you will earn your badge! Contact us for rates and availability. 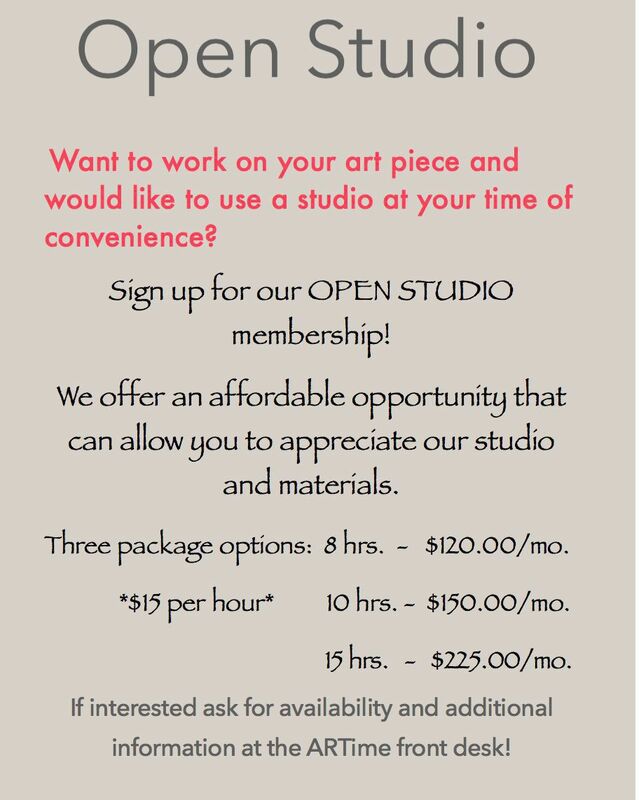 Our Open Studio Membership for Adults allows you the freedom of an art studio where you can work on your piece and on your own time. We have times and days where you will be more than welcome to work in our studio and the memberships that we offer grant you up to 15 hours of creativity! 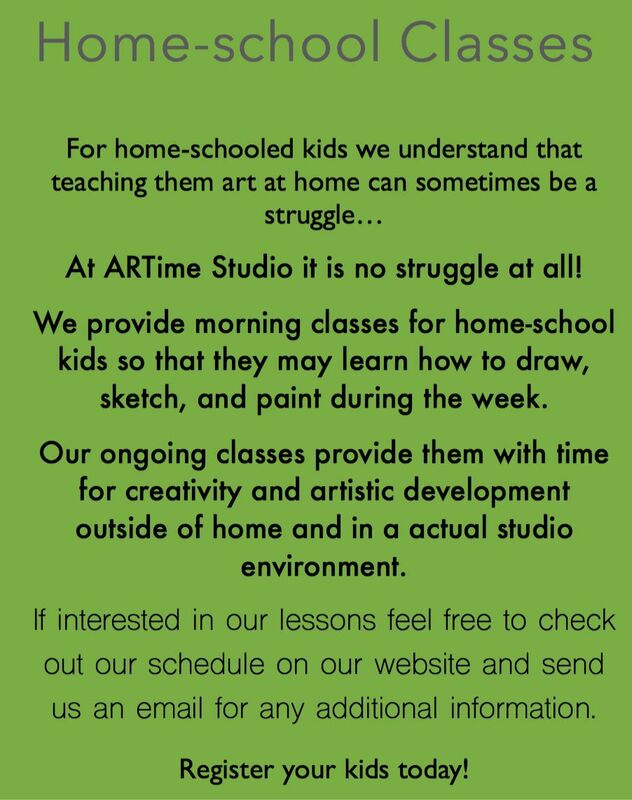 Our studio offers morning and afternoon classes for home-school students who want to have art as an extra-curricular! Our ongoing classes provide them with time for creativity and artistic development outside of home and in an actual studio environment. ARTime offers painting and ceramics classes of all levels for practicing, native, interested, or learning Spanish speakers! At ARTime Studio we offer classes tailored for those native, practicing or interested Spanish speakers. Our head instructor Gabriela Moreno is a born Spanish speaker and teaches the same curriculum but in Spanish. So if your a part of the Immersion Spanish Program at school, are a native Spanish speaker, or looking for a fun way of learning how to draw, sketch and paint in another language then these are the the classes for you! jArte en espanol, que divertido! The city of Mission Viejo offers classes in its activities brochure. Our head artist and owner holds a couple of classes with the city outside of the studio! If you were looking for some classes like The Power of Street Chalk and Beading, Miss Gabriela teaches them! Check it out!